There’s no mistaking the distinctive sensory experience of real dried porcini mushrooms from the Borgo Val di Taro, a.k.a Borgotaro, valley. Their tangy aroma reminiscent of sourdough, their creamy smooth but satisfyingly springy texture that seems to softly burst in your mouth with nutty and slightly meaty flavor. Chefs the world over consider porcini to be the most versatile and rewarding mushroom, but Borgotaro porcini are certifiably in a league of their own. Creamy white and chestnut brown in color, they come packaged clean without hay or bits of wood, with the shape of their stalks and caps nearly intact - all signs of quality production. These Porcini Secchi are carefully selected, cleaned and sliced by hand. They are slow-dried in an oven for up to 30 hours at a low temperature - no more than 95 degrees Fahrenheit. After they are dried, they undergo a second selection, and only the thickest slices are chosen for retail sale. 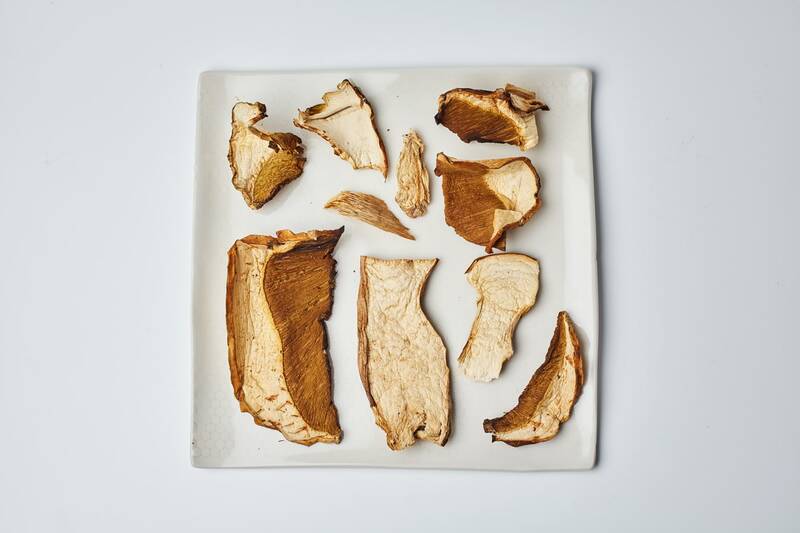 To prepare dried porcini mushrooms, cover in lukewarm water for about 30 minutes. Drain, but save the liquid, since it’s full of rich umami flavor and fantastic for a homemade broth! Rinse under cold water and strain reserved liquid through a coffee filter. They’re perfect for a classic Italian risotto with carnaroli rice and plenty of good olive oil and Parmigiano-Reggiano, but also delicious in soups and stews, as a filling for ravioli, or in a dish of fresh tagliatelle with pancetta and chopped parsley. Borgotaro porcini come from Valtaro, a valley of the Taro river in the Apennine mountains where Emilia Romagna, Tuscany and Liguria meet. Valtaro sits at an altitude of about 1,300 feet and is covered in dense forest of chestnut, beech, oak and poplar trees. It’s an area where the woods, the soil, and the climate are so porcini-perfect that it was given the IGP status by the European Community in 1996, but porcini (Boletus Edulis) have been known to grow there for centuries.